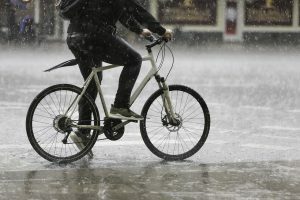 For those who cycle to work there’s probably nothing worse than waking up to find it raining. Knowing that the ride home is going to be a soggy one even though the rain might have stopped. Once you get to work you could find a radiator to hang you wet cycling gear on but that’s probably going to annoy your colleagues with that damp drying smell permeating the office and if it’s spring/summer the heating might not even be on. What’s the solution, we hear you cry! A drying locker! Which is sort of like a tumble dryer and gym locker all in one. 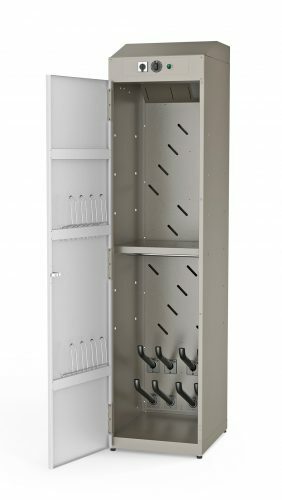 It has a clothes rail for jackets and tops a shelf for helmets, holders for gloves and quite probably the best bit it nozzles to hold shoes down the bottom. Shoes can take ages to dry and is there anything worse than damp wet feet, probably not. 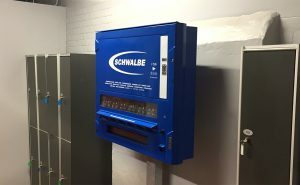 The cycle drying locker doesn’t require any installation, it’s just a case of plugging it in and drying your kit. It’s footprint is relatively small so wouldn’t take up much space in an office, well unless your office is the size of a cupboard. You don’t always have to use the 800W heating element for rapid drying, you can use the more energy-efficient ambient air drying option. You can also set a timer for up to 6 hours. 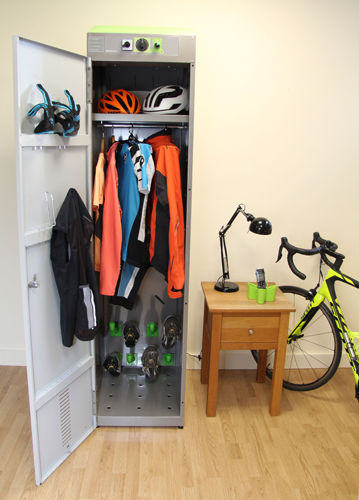 If there are lots of keen cyclists in the office and it looks a little on the small size for all their kit, the drying locker is modular to allow easy expansion.